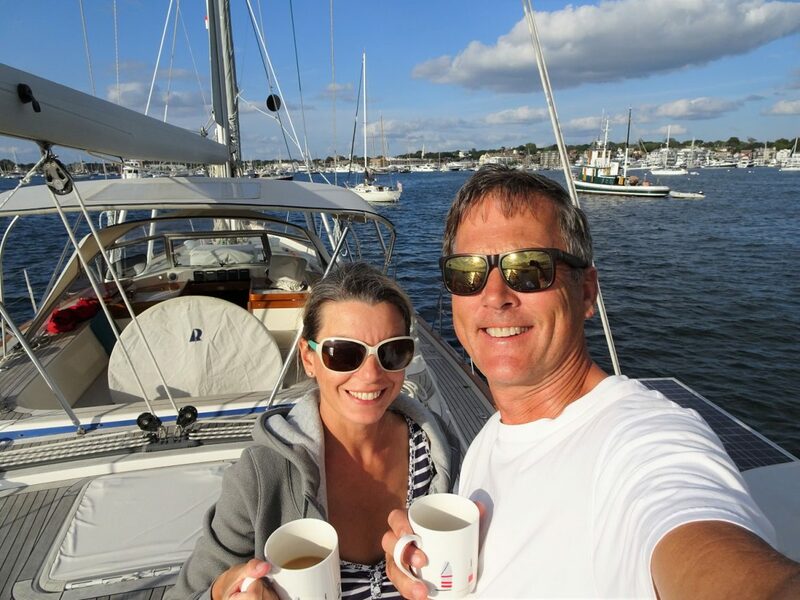 Friday 31 August: Cuttyhunk Island Massachusetts to Newport Rhode Island, with a boat collision during night. We went to bed reluctantly as we are anchored very close to a moored fishing boat and the wind is blowing hard in the rigging. And sure enough, at 1am we hear a big bang and s/v Cloudy Bay shudders. We jump out of bed thinking we have swung into the fishing boat but when we come out into the cockpit we see the bow of a boat right under our dinghy davits. It’s the yacht that had previously been anchored 2 boats upwind of us. 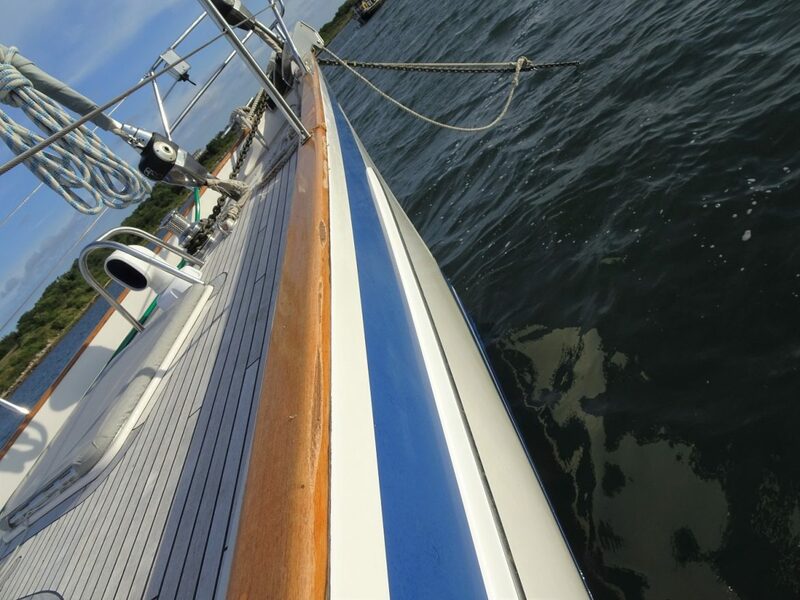 Their anchor holding had failed and dragged backwards toward us, hitting their bow roller on our starboard gunwale, making two holes through the gel coat into the glass fiber and taking chunks of wood off our varnished gunwale over a length of 8ft. Bugger! would summarize the many other collective expletives uttered by Glen when he saw the damage. The other yacht’s anchor had dug again and the boat is now positioned directly behind us, so close infact that Glen can see its chain taught and catching on our rudder. So he shouts to the owner to let out more chain, which he does. The wind continues to blow 20+kts, and we are reluctant to go back to bed. So thermal gear on and we stay in the cockpit monitoring the boats around us. At 2am we decide we’d better do shifts, so Oana goes to bed while Glen remains up. The wind eases its strength towards the morning and Glen has cat-naps in the cockpit. When the dawn cracks, we see the damage in daylight. Lee, the owner of the boat who scraped us comes onboard and we discuss the damage and the insurance policies. All very amicable. We guess we should feel lucky that the damage is infact only cosmetic and won’t stop our travels. Still very annoying though. A scar on s/v Cloudy Bay’s good looks. By 10.30 am we are ready to leave Cuttyhunk Pond. Up comes the anchor, together with a lump of mud. Certainly less twitchy motoring out of the narrow channel at high tide, we see a constant 4m depth, phew! Sails come out, and we are on a nice broad reach in 20kts of wind. We are going fast, boat speed 8.6kts. In the distance we see lots of boats sailing, some towing dinghies upwind. When the wind drops to 15-17kts, it also swings a bit more behind us. So we put the retainer on the boom and furl away the genoa as it isn’t really doing anything other than flapping and annoying us. Then as we gradually turn towards the channel into Newport, we go harder into the wind with both sails out. Lots of action on the channel. Fishing boats and ferries speeding, and sailing boats gliding in all directions. A bit of a chaos with no apparent rules of the road. Next to Newport town we find an anchorage, and although a fair amount of boats are anchored, there is still plenty of space. We survey carefully, as there is an underwater cable area, and we chose our spot. Luckily, quite close to the town. The sun is randomly popping out from behind the clouds, and when it does, there is a nice feel about this bay. Lots of boats are sailing into their moorings, and we admire them from the aft deck. There is even a super yacht which looks like new, motoring towards the marinas, with a big drone flying over it. It appears to have floated out of large ship anchored in the bay and marked “roll dock” on its side. We guess this is how the new super yacht has been delivered. Just before sunset we are ready to go ashore. The dinghy trip is short and dry, just as we like it. And the dinghy jetty is conveniently right next to the Old Quarter. We have a stroll along the wharfs, where there is quite a buzz, with lots of restaurants and bars and pubs. Then we walk along the main street, to get a feel of this place. Nice old buildings and very commercial. When we start feeling chilly, we stop at a bar which is located in a former bank, and the old vault doors are conspicuous behind the bar. This bar has only just opened today, and while we sip our beer we observe the staff how they try to keep busy or how they look for liqueur bottles and ingredients, not being used with where everything is. We return to the wharfs area hoping to come across a nice indoors bar, as we feel quite cold by now. The only nice one is very busy, so we postpone it for tomorrow and return to the dinghy. Back on s/v Cloudy Bay we are not exactly full of energy after not much sleep last night, and we retire to bed early. Few minutes after we were nicely tucked under the duvet, we hear loud voices from outside and what sounded like a bang on our hull. We jump out of bed “what the hell, did we just get hit again?”. As we emerge in the cockpit, we see two dinghies, one towing the other, sounding like they had a bit too much to drink, and looking for their boat. Back to bed, fingers crossed it will be a peaceful night. No more rammings, please!